Wigner distribution (left axis) and temporal profiles (right axis) of laser pulse after reflection from PM with Fpm. (a) 140.0 J/cm2, (b) 50.0 J/cm2, (c) 23.8 J/cm2，(d) 14.0 J/cm2，(e) 9.2 J/cm2, (f) 6.5 J/cm2. The interaction of ultrashort intense laser with plasma could produce energetic particles (electrons, positrons, neutrons and ions) and ultrafast radiation sources from microwave to γ-ray. These novel secondary sources have promising applications in the material science, medical biology and future energy. With the increase of achievable intensity of high-power lasers, the requirement of higher temporal contrast, has been a growing issue for efficiently producing these sources. Plasma mirror (PM) is a robust technique in improving the laser temporal-intensity contrast which is widely used in almost all the high-power laser laboratories. The contrasts of PM-reflected laser pulses are generally characterized in nanosecond and picosecond time scales. However, laser temporal profiles of PM-reflected laser pulse in sub-picosecond regime have not been investigated experimentally. The pulse duration after employing the PM was thought to be unchanged in analyzing the experimental data. 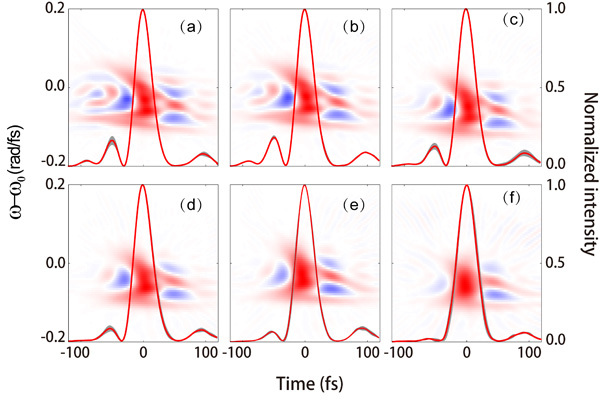 The research group led by Prof. Jie Zhang has measured, with high temporal resolution in the sub-picosecond window, the laser temporal profiles, spectra and phase of the PM-reflected pulse as a function of laser fluence on PM. They found that the leading front and the width of laser pulses depend sensitively on the incident laser phase and fluence on PM surface. Spectral modulation was found to play a key role in pulse profile shaping. The prepulse-suppressed laser pulses have important applications in the interaction of laser with ultra-thin solid target. The results will extend our knowledge on proper utility of plasma mirror technique for temporal contrast improvement and applications. This work has been published in Chinese Optics Letters, Volume 16, Issue 10, 2018 (Xulei Ge et al., Pulse shape of ultrashort intense laser reﬂected from a plasma mirror). "The prepulse-free laser pulses could find important applications in more advanced ion acceleration schemes, such as radiation-pressure acceleration, and high harmonic generations from solids." said Dr. Xiaohui Yuan from the research group. The relevant experiments are being planned by using the PM technique.